Something tangible from your wedding day is always the goal. Your wedding photos deserve to be loved, shared, displayed, and held. I CAN'T THINK OF A better way to do that than to showcase them IN a beautiful wedding album. Albums are printed on Fuji Crystal Archive paper and bound by hand. The photo spreads are creased for a full panoramic view, yielding a seamless transition from page to page. You can rest easy knowing your album is guaranteed for life against any manufacturing defects. Left: Lay-flat detail. Right: Page thickness & side detail. Size, Cover Type, Color, and other Add-on* selections are made. Option I - You can "Favorite" all the photos you'd like to include in your album through your Online Wedding Gallery. This is a good option if you want full control over the images that are in your album. Option II - We do a mix of both your photo selections and some photographer favorites. This is a good option if you want to have a hand on the photo selections but still want my creative eye. Option III - You leave the curating up to me and I create the story of your day for you. This is a good option if you want me to have full creative freedom in designing your album. Once selections have been made, the design process begins. The layout of your album starts to take shape and the story of your day becomes tangible. A page-by-page digital proof is sent for your approval. Changes and substitutes to the layout are made (if any). Your album gets ordered and is on it's way to your lap! Albums are offered in Leather and Linen in an array of gorgeous colors and sizes that will complement your wedding photos and the environment where you'll be showcasing your album perfectly. Wedding Albums include 20 spreads (40 pages). Additional spreads available. 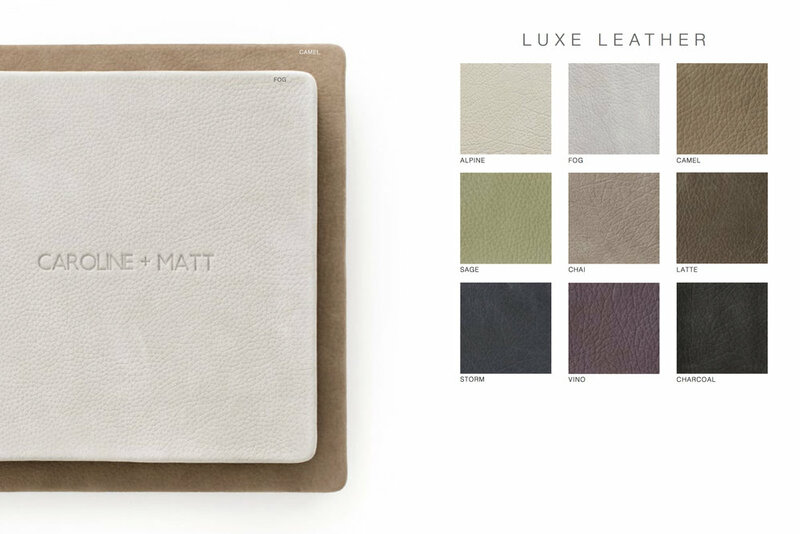 Leather albums embody a traditional, classic look that stands the test of time with a range of Italian leathers in varying grain sizes and textures. 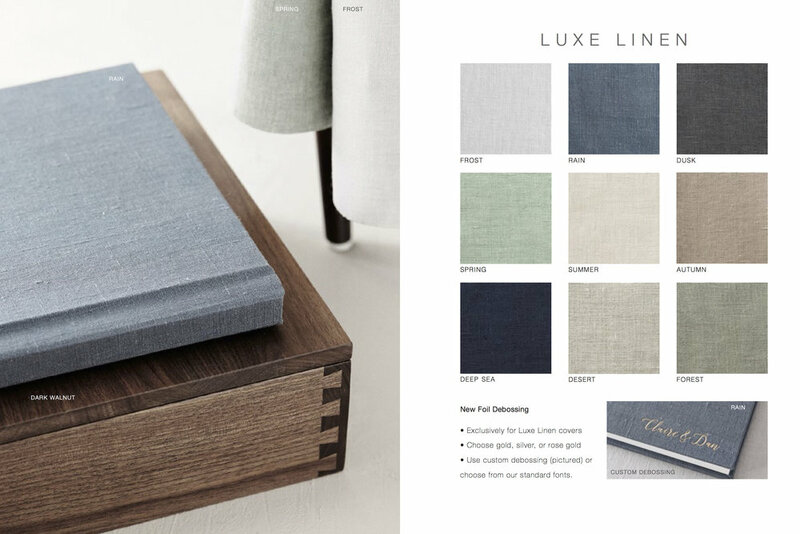 Luxe Leather add $35 for 10" album, $55 for albums larger than 10"
Premium linens and Japanese Silks bring a crisp, modern sophistication to any album. Choose from a selection of rich colors and patterns. Add personalization with cover debossing or photo cameos for a unique finish. Debossing complements an album cover making it unique to you. Standard debossing fonts and custom debossing gives you the freedom to use any font you’d like. The perfect add-on for parents. Minis are scaled down replicas of your flushmount album, made from recycled materials leftover from your larger album. Minis are roughly 6×6, so if your album is square, it will be 6×6. If your album is rectangle, the Mini will vary based on width/height ratios. Cameos and debossing are not available. ARE YOU READY TO ORDER YOUR WEDDING ALBUM?